If you are a student at McNeese and you are looking to major in art or you already major in art then you need to check out Painting with a Twist in Lake Charles. It isn’t just a boring art class, it is a party. The twist in Painting with a Twist is what makes it a party. The twist means they encourage you to bring in your favorite beverage of liquor and hour d’ouvres if you would like. Who says you can’t paint and party together? This is why Painting with a Twist has been the latest craze in the arts and entertainment world. After taking a class at Painting with a Twist in Lake Charles you not only go home with great art but with new friends and a feeling of accomplishment. 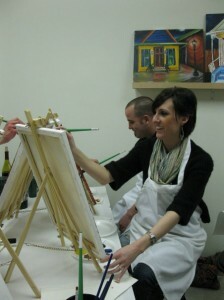 The Painting with a Twist experience! When you take an art class at Painting with a Twist you will have a trained instructor walk you through the entire process. If you need help on certain areas then they will be at your side but if you would like to explore the canvas then do whatever makes you happy. They are there to guide you if needed and ultimately to keep the party rolling. The events last from 2-3 hours depending on the painting that you chose and everyone goes home with a complete masterpiece for there collection. They believe that everyone has an artist within and Painting with a Twist is here to bring that artist out of you. To book your class visit their website at Painting with a Twist in Lake Charles and search their calendar. Once you find the perfect painting on a perfect day then add it to your cart and checkout. During the checkout process you will need to fill out the reservation form and make payment to secure your spot. That is it! All they ask of you is to show up early to receive all of your supplies which they provide for you. If this sounds like the perfect place for you then do not hesitate and book your class today. You will be so happy you did! This entry was posted on Thursday, March 4th, 2010 at 2:41 pm	and is filed under Studios. You can follow any responses to this entry through the RSS 2.0 feed. You can leave a response, or trackback from your own site.